What could have been so bad? The world of We Happy Few is an odd one indeed. Wellington Wells, the fictional English city that serves as the backdrop for the game, is inhabited by people who maintain a constant state of happiness thanks to a little drug called Joy. This pink little capsule erases all memories of suffering and despair as it twists the faces of its users into nightmarish grins. While being perpetually happy sounds like something great, it’s coming at the cost of erasing everything. Why would anyone want to completely erase their past for a farce? It turns out that the people of Wellington Wells are trying to bury their guilt of a Very Bad Thing they once did. Now, if you’ve played We Happy Few, you’re aware of the twisted nature of the people living within the game’s confines. They are not just overly joyous, they are also extremely cautious. In their eyes, the biggest threat to their happiness is not death, but a Downer, a person who refuses to take Joy and remembers all. What could that Very Bad Thing have been that it drives an entire society to fear anyone even slightly remembering it? 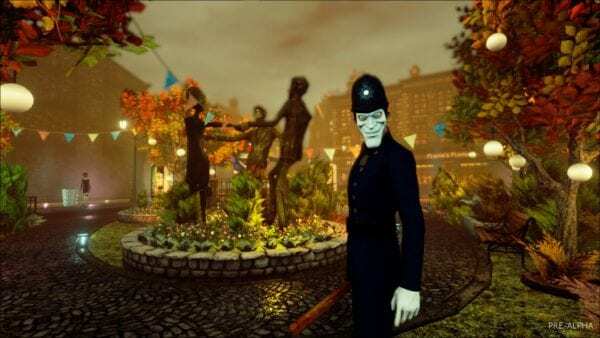 While the full We Happy Few story isn’t presently available in the Early Access build, there are some clues lying around the world that may give some insight into what that fateful event was. First, let’s go over what we know for certain. We Happy Few takes place in an alternate universe where Germany successfully invades and occupies England during WWII. While there, they destroyed a lot of the country, which is why you see so much debris and people living in squalor on the outskirts of Wellington Wells. The people of England had to do something to end the occupation, and they figured that something out. They did the Very Bad Thing, something so heinous that scientists created Joy to erase if from their minds. One other thing that we do know, for now at least, is that there seem to be no children in the world. 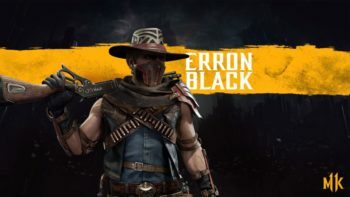 At first, this seems like a design choice for a decidedly mature game, but Compulsion Games makes every effort to call attention to this omission. While walking around the Garden (the first area after the prologue), you’ll hear Wastrels complaining about tiny beds and all of the toys, as if they’re an annoyance. It seems as if they can’t even stand the reminder of these children who are nowhere to be seen in the world. This helps to point towards the Very Bad Thing having something to do with this utter lack of youth in We Happy Few. The pointing becomes a bit stronger when a few possible Easter eggs come to light. The Wellington Wells newspaper is called “The Hamlynn O’Courant.” That name, Hamlynn, has a very close resemblance to Hamelin, the town in which the story of the Pied Piper occurs. After requesting the Pied Piper’s services, the townspeople neglect to pay him so he instead takes their children to complete the deal. This particular reference could possibly be much more than just a simple Easter Egg. Perhaps the Very Bad Thing could have involved a deal go wrong, and in order to pay for their transgression, the people of Wellington Wells had to give up their children. Who collected the children, if they were even collected, is unknown. The Pied Piper reference can simply be a clue that the adults used the kids in some fashion, not necessarily gave them up to some other human. Although, if I was to make a guess at who would be We Happy Few’s very own piper, I’d bet on Uncle Jack. He’s the man always speaking words of Joy and wisdom on the television. Also, the closer you get to where people are “happily enjoying” their lives, Jack appears more often, along with some much improved technology. It is possible that the citizens entrusted their children to the government to experiment and come up with some way to rid their homes of the German invaders. The fact that you can find a statue of two adults and a child spinning around in the area that Wellies (those who take their Joy) inhabit, helps to lean towards government involvement. It gives children a sense of importance to be part of a monument that seems to come from after the invasion (and after children must have disappeared entirely), further playing into the notion that they played some large part, if not the only part, of the Very Bad Thing. One theory brought up in Compulsion Game’s We Happy Few forum uses yet another piece of literature to further push the fact that the absence of children isn’t a mere coincidence. Referencing “The Ones Who Walk Away From Omelas” by Ursula K. Le Guin, this theory posits that the children are either sacrificed, or used to fuel the perpetual Joy of Wellington Wells. There are even Easter eggs about Alice in Wonderland, yet another tale about strange occurrences involving children. Weird messages that pertain to Wonderland’s white rabbit, and even Arthur spouting off lines from the Mad Hatter all bring everything to the surface. All of these solid literary clues can’t be an accident. We all know the Very Bad Thing is something regrettable, and the game goes out of its way to point our direction of the children, or lack thereof. It may not be entirely clear what the residents of Wellington Wells seek to remove from all memory, but it’s safe to say that the fate of the children and the Very Bad Thing are intertwined. We’ll have to wait for more narrative to be added into We Happy Few before reaching a definite conclusion, but for now, the wheels are turning.